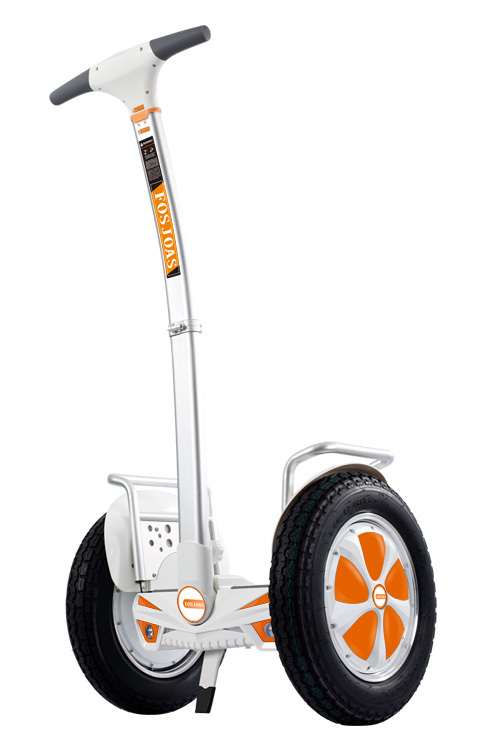 Fosjoas intelligent two wheel scooter U3 use the original Sony lithium batteries, famous Cheng Shin tyres and synthetic resin shells which are made of advanced nano materials. They appear much rougher than other models. Because they are equipped with two larger wheel hubs, whose size is 16-inch. The larger the contact area between tyre and the ground is, the greater the force of friction they will exert. The bigger tyres help users easily cross the washboard road. As the newest product, Fosjoas U3 hews out a new way of self-balancing scooters. V9 focuses on short-distance trips, while U3 pays more attention to its off-road functions. The maximum peak of U3's motor is 1500W, and its output power is the biggest in all models of Fosjoas self-balancing scooters. The powerful motivator makes U3 easily climb hills, just like riding on flat roads. The battery capacity of U3 is up to 680Wh, and is the largest among all as well. In the tests of real road conditions, Fosjoas U3 can run 45 to 50 kilometers with full power. The longer range of U3 helps users to fully enjoy travelling outdoors. Besides, Moben designers apply many security details to U3, such as seal circuit, waterproof and dustproof, dual chips and double battery protection plate. If citizens use U3 as their vehicles, they just need to enjoy it, rather than worrying about the range and safety problem. Thus, Fosjoas U3 self-balancing electric scooter will lead the new trend of future commuting.